people who were never even charged -- let alone convicted -- of a crime. The bipartisan legislation is supported by groups as diverse as the ACLU of Michigan and the Mackinac Center for Public Policy. Both say the bills Snyder signed today are a significant improvement but don't go far enough. House Bills 4499 and 4500, and HBs 4503-4507, which Snyder signed in a brief private ceremony attended by bill sponsors and supporters, raise the standard of proof required for police and other agencies to seize property through civil forfeiture from a preponderance of evidence to clear and convincing evidence. They also significantly increase the amount of public reporting required of forfeiture activities, to increase transparency. Michigan law allows government agencies to seize property suspected to have been used for or purchased with proceeds from certain crimes such as drug trafficking, prostitution, gambling or racketeering. Though citizens can petition a court to have their property returned when it is not connected to the commission of a crime, many citizens cannot afford the costs, including the posting of a bond and legal fees, to do so. Police and prosecutors say the laws, used properly, act as a deterrent to crime, strip criminals of assets that can be used to commit further crimes, and save taxpayers money. 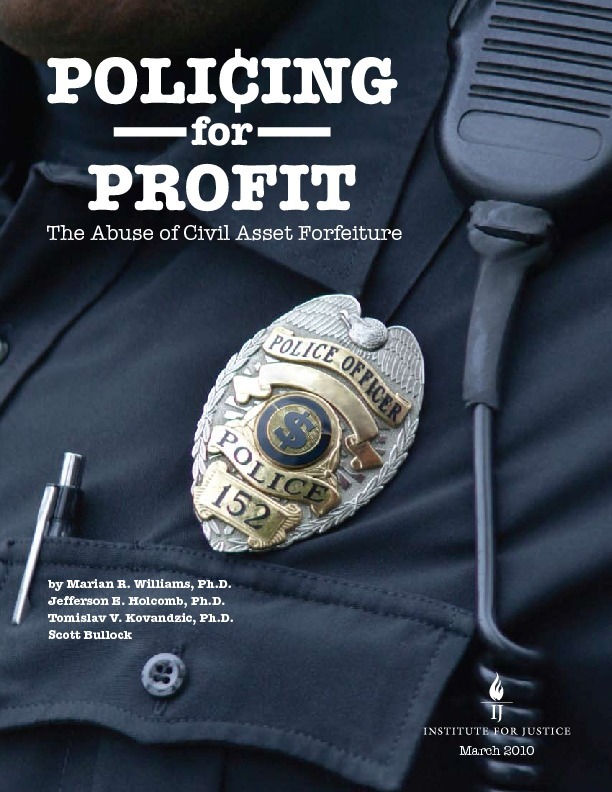 But some of the proceeds from forfeited property are used by the law enforcement agencies that seized the property, raising concerns and criticism about "policing for profit." One of the better-known and most controversial uses of civil forfeiture occurred in Detroit in 2008, when a police SWAT team raided the city's Museum of Contemporary Art, where 130 patrons were celebrating Funk Night, a monthly party of dancing, drinking and art gazing. The patrons were forced to the ground at gunpoint and, in some cases, purses were searched. All of the patrons were issued tickets for "loitering in a place of illegal occupation," because the museum had failed to get a permit to serve alcohol. Then police began confiscating their cars, having them towed away under the city's nuisance-abatement program and insisting that patrons pay $900 apiece to get them back. The ACLU filed suit and the city agreed to drop the criminal charges but refused to return the cars. Hopefully our legislature, also dominated by Republicans, will note the extensively documented abuses of civil forfeiture in Indiana and adopt similar changes if not end the practice completely. Nobody’s property should be seized prior to criminal conviction, and then the seized proceeds should compensate victims, not enrich government.